If you want to buy a Robertsdale High School yearbook or sell your Robertsdale High yearbook, this is the place to do it. Just make a post below to find another person who went to school in Robertsdale to make the trade. 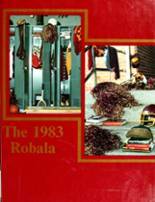 While you are reminiscing about the times you spent in high school at Robertsdale High School, you should also check out alumni photos, yearbook listings and share any reunion info if possible. Lost mine in a fire. i am looking for a year book from 2001! There is a photo in this yearbook of my husband and I dancing together at prom. I was a freshman and he was a junior and we are still together 12 years and 3 kids later. I would really love to have that yearbook. It is the only one from my four years at RHS that I do not have. Thanks for any help!